Here at Winfields, we absolutely love Yorkshire. The people, scenery, towns and cities, it’s one of our favourite places in the UK – there’s a reason it’s called God’s own country. We even have a store there! If you’re heading to Yorkshire for a few days away (or indeed if you live there), you’re a bit spoiled for choice of things to do. Do you see the fantastic countryside, take in some historical sites or maybe a spot of evening entertainment? 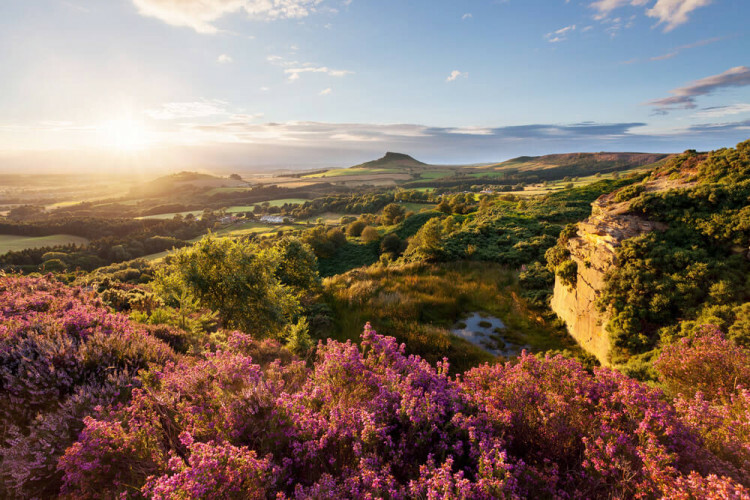 Don’t worry if you don’t know what to do or where to go – we’ve compiled a list of 50 amazing things to do in Yorkshire, with a little something for everyone from family days out to romantic locales for couples. Take a look below and see what takes your fancy for your next trip up north. The National Science & Media Museum in Bradford is quite simply wonderful. For anyone with even a passing interest in science and technology, this is somewhere you can spend an entire day, if not longer. There are new exhibitions on all the time, covering a wide range of exciting topics, including space, video games, movies, and much, much more. And best of all, it’s completely free entry! Visit their website now to see what’s on. For railway and train enthusiasts, the National Railway Museum in York is like the Holy Grail. They have a huge collection of engines and carriages to browse, as well as a plethora of other railway-related bits and pieces. It’s a great learning environment for children as well, and even if you aren’t a train addict, you just might be afterwards. Visit the National Railway Museum website to learn more. To learn about local and global history, the Yorkshire Museum is a must. They always have fascinating exhibitions on display, whether it’s about vikings, dinosaurs, the Romans, or whatever else is currently being featured, as well as all the regular collections, covering astronomy, biology, geology, and much more. Take a look at the Yorkshire Museum website for more info. For those with an arty side, don’t miss out on visiting the fabulous York Art Gallery. Again, there are always fantastic exhibitions on, often from world-renowned artists, as well as the regular collections, so you’ll never be stuck for amazing artworks to peruse. Check out the York Art Gallery website. One of York’s most famous attractions is the Jorvik Viking Centre. The UK, and York in particular, has a rich Viking history, and this is the perfect place to discover it. From how and why the Vikings were here to genuine Viking artifacts, you can learn all about this fascinating part of our country’s history. And depending when you go, you might even be able to check out the biggest Viking festival in Europe. Visit the Jorvik Viking Centre website to find out more. Three amazing York-based museums there. We chatted with Visit York about why it’s such an amazing place. Sally Greenaway, Head of Visit York said: “York is a vibrant festival city with Roman roots and a Viking past, offering an adventure for everyone. 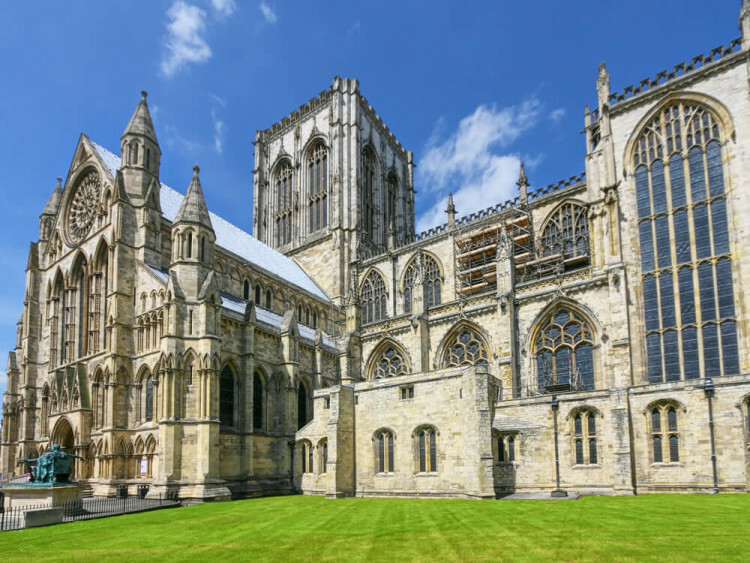 Perfectly placed half-way between London and Edinburgh and with the spectacular Yorkshire Dales, North York Moors and Wolds right on the doorstep, York is unlike any other English city. The Thackray Medical Museum in Leeds is a beautiful building with a rich history. If you have an interest in medicine, or just want to learn more about this fascinating building and the Thackray family, there’s a library’s worth of material, plus plenty of other interesting collections to browse. See more about the Thackray Medical Museum on their website. Another amazing museum in Leeds, the Royal Armouries is Britain’s national museum of arms and armour, so is a wonderful day out for history buffs. The origins of the museum actually date back as far as the 16th century, although it’s a little more modern these days! There are also sites at Fort Nelson and the Tower of London. See more on the Royal Armouries website. Another one for the history fans, Eden Camp is a fascinating insight into just a small part of World War II. Converted from a prisoner of war camp in Malton, you’ll learn a general history about the war, as well as about what happened at the site. Visit the Eden Camp website to learn more. The collections at the Bronte Parsonage Museum are the largest and most important of their type in the world, and so shouldn’t be missed by literature fans. Located in the picturesque village of Haworth, they have some amazing artefacts and collections to view, as well as timed exhibitions and literary festivals throughout the year. The Hepworth Wakefield is the largest purpose-built exhibition space outside of London. With a stunningly designed building, the award-winning gallery includes a wide range of exhibitions, including, of course, works by the famous Barbara Hepworth. See the gallery’s website to see what’s on. Graves Gallery is wonderful visual art museum in Sheffield, covering a wide variety of art and exhibitions. 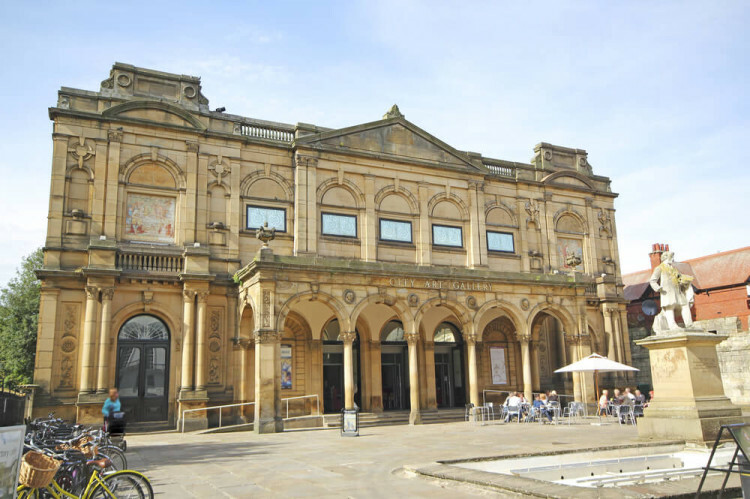 It is run by Museums Sheffield, which also runs a couple of other fantastic sites – Millennium Gallery and Weston Park Museum, which are also well worth a visit. See the Graves Gallery website for more info. York Minster is the largest cathedral of its kind if Northern Europe. Its Gothic in design and pretty spectacular, and it also features the Great East Window which dates back to 1408 and is the largest expanse of medieval stained glass in the world. If you haven’t been to York before, then York Minster is an absolute must. Visit the York Minster website for more information. Referred to as “England’s finest Georgian town house”, this resplendent property was restored to its original glory by York Civic Trust in the early eighties. It features collections of furniture, paintings and other decorative arts , as well as various exhibitions over the year. Visit the Fairfax House website for more information. One of the most stunning country houses in Yorkshire, if not the whole of the UK, Howard Castle and its grounds are quite simply breathtaking. You might also recognise it as it was featured in the BBC’s adaptation of the sequel to Pride and Prejudice, Death Comes to Pemberley. Visit the Castle Howard website for more information. Scampston Hall and its gorgeous award-winning walled gardens are a fantastic place to spend a sunny afternoon. Located just south west of Scarborough, the hall also hosts various exhibitions and fairs throughout the year. Take a look at the video below to see what it’s like, or visit their website to learn more. Based in Harrogate, the RHS Harlow Carr is a microcosm of the Yorkshire countryside and a really wonderful place to visit if you love plants, flowers and greenery. They also hold family friendly activities throughout the year as well as courses and workshops. See more on the RHS website. Whitby Abbey is famous for being one of the inspirations for Bram Stoker’s gothic classic Dracula. It’s a wonderful place to wander around with fantastic views, and with the beautiful seaside town of Whitby just a short walk away, it makes for an all-round brilliant day out. Read more about Whitby Abbey. Fountains Abbey and the accompanying Studley Water Gardens is a World Heritage Site, and it’s not difficult to see why. The ruins are a fascinating snapshot into medieval life, while the lush lawns are a wonderful place for a picnic. You might even spot a deer or two in the grounds. Learn more on the National Trust website. Another World Heritage Site, Saltaire Village is a Victorian model village in Shipley, near Bradford. Taking its name from the village’s founder, Sir Titus Salt, and the River Aire that runs through it, there are a number of wonderful buildings and cottages that may well make you want to move there! Not a specific place as such, the Yorkshire Nature Triangle, led by the Yorkshire Wildlife Trust, is a part of the county that roughly covers the area between Scarborough, Withernsea and Selby. It is a wildlife lover’s paradise, with just some of the highlights including the UK’s largest colony of gannets, the most visible mainland colony of puffins, and you might even spot some seals, dolphins and whales. A list of things to do in the Yorkshire Dales National Park would be a post in itself, but here we’re just going to celebrate the whole thing! There are so many wonderful places to visit in the national park; it really is one of the most beautiful parts of the country. Perfect for walkers, bikers, holidayers, foodies, and just about everyone else, you’ll never be stuck for something to do. Visit the Yorkshire Dales National Park website for more information. With beautiful rolling hills, Malham Tarn Estate is a stunning part of the Dales. A haven for hikers, cyclists and nature lovers, you can visit Malham Cove, the Queen of the Fairies waterfall, and a National Nature Reserve full of wonderful flowers and animals. Find out more about Malham Tarn Estate. Located in the South Pennines, Hardcastle Crags is a 400-acre area of unspoilt woodland. It’s nature at its very best, with streams, waterfalls and walking paths to explore. There is also the Gibson Mill, which tells the story of the valley, and interestingly has no link to the national grid so generates all its own electricity. Learn more about Hardcastle Crags. If stunning coastal scenery and sea birds are your thing, then Bempton Cliffs is the place to be. It’s home to the Yorkshire Seabird Centre where you can see gannets, puffins, short-eared owls, and more. Learn more about Bempton Cliffs. Right on the banks of the River Wharfe in the Dales you’ll find Bolton Abbey, and a more picturesque location you couldn’t hope to find. 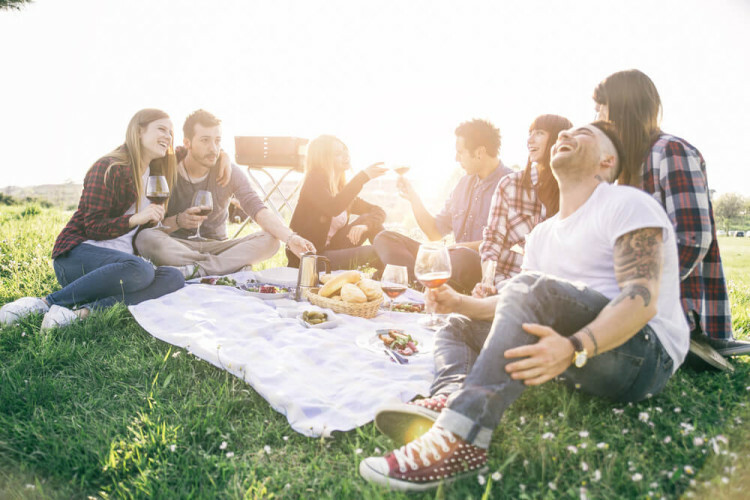 You also have the 30,000 acres of surrounding countryside and over 80 miles of footpaths to discover, and there are a number of local eateries to refuel at before you head out again. Plan your day on the Bolton Abbey website. This picturesque series of waterfalls on the River Ure in Wensleydale are known as one of the natural wonders of the North of England, and have been inspiration for writers, painters, and has even been the site of major Hollywood movies. There is also acres of wonderful woodland to explore in the surrounding area, so makes for a great trip out for the family or a romantic excursion for couples. 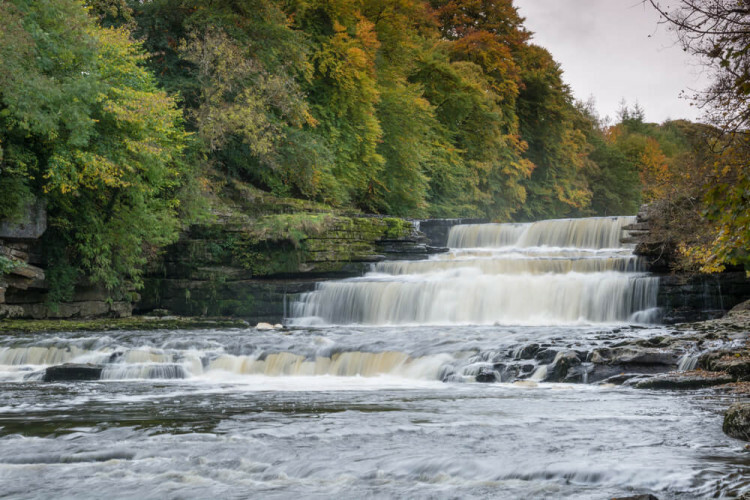 Read more about Aysgarth Falls. A bit of a time-sensitive one here, but if you’re in Farndale during spring, a leisurely 3 mile circular walk to see the thousands of beautiful daffodils is a great way to spend an hour or so. Even if it’s not spring, it’s a lovely part of Yorkshire to check out any time of the year. See the route over at the North York Moors website. 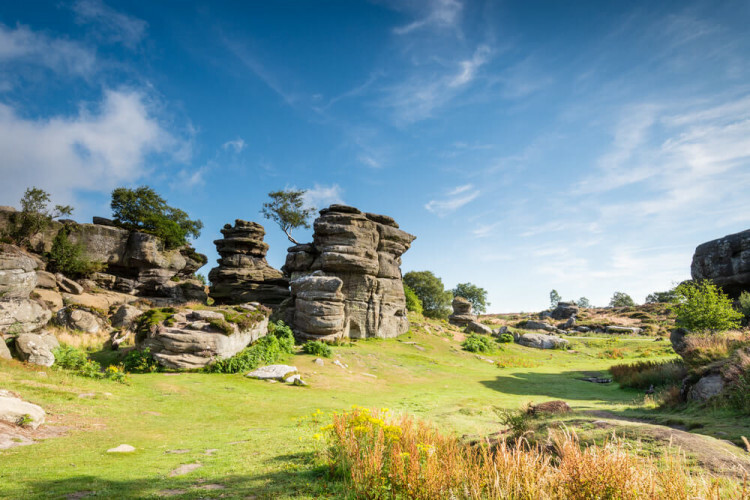 Some of the rock formations at Brimham Rocks are quite spectacular, and the views from the top even more so! The rocks are fantastic fun for the whole family to clamber up and work your way around, and if you’re a serious climber, there’s plenty to go at here too. See more about Brimham Rocks. One of the most unique things about the coastline in Yorkshire, is that it’s littered with dinosaur fossils, hence the name given to it. The area around Scarborough is a fantastic place to go exploring with the kids, and they even run organised fossil hunting trips. Robin Hoods Bay is nearby and also well worth a visit. Learn more about finding fossils on the Dinosaur Coast. Does this count as the great outdoors if it’s technically underground? We’re including it anyway because it’s such a fantastic experience. The longest show cave in Britain, White Scar Caves runs under the Yorkshire Dales National Park for about a mile, and with sections called The Witch’s Fingers, The Devil’s Tongue and The Battlefield Cavern, how can you not visit? Visit the White Scar Cave website to find out more. Nosterfield Nature Reserve is a 150 acre area of wet grassland and open water located between the rivers Ure and Swale. The scenery is nothing short of stunning, and you can see a wide variety of birds and insects, so don’t forget your camera. Found out more about Nosterfield Nature Reserve and the Lower Ure Conservation Trust who run it. If you have a fascination for all things under the sea, then The Deep in Hull is an essential visit. One of the “most spectacular aquariums in the world”, there are some amazing sea creatures to check out, including sharks, turtles and jellyfish. They even have penguins! You can watch feeding times and even get in with the animals yourself. Check out their website to plan your visit. Continuing the theme of amazing animals we have Yorkshire Wildlife Park near Doncaster, which is home to some magnificent beasts from all over the world, including meerkats, leopards, lions, tigers, and even polar bears. The Forbidden Corner is a wonderful labyrinth of tunnels and pathways that is fantastic fun for the family to get lost in. Located in the Yorkshire Dales, it was originally a private folly, it was opened up to the public due to high demand. Check out the video below to see what delights are in store, or visit their website for more information. In a beautifully green part of Wakefield you’ll find Yorkshire Sculpture Park, and it really is quite something. 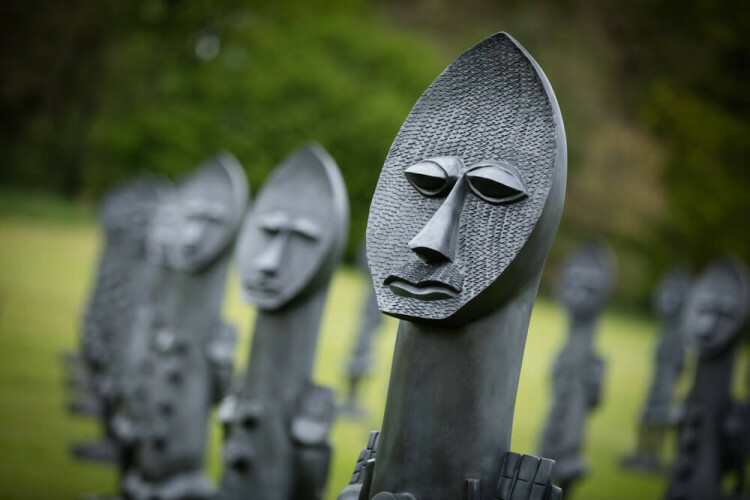 Featuring an array of impressive sculptures, there’s always something fascinating to see, and there are often events, exhibitions and workshops running as well, so you can get involved too. See more on the Yorkshire Sculpture Park website. Everyone loves a maze, and York Maze is a fantastic one! In fact, the giant Maize Maze is the largest in Europe, and there are a number of other ‘maze-based attractions’ to check out. This is a day out that both adults and kids will absolutely love! See more about York Maze or watch the video below. Located in Halifax, Eureka! is amazing place for curious kids with an interest in science, nature, or just learning in general. If you want to keep the kids amused for the day, and maybe even inspire them a bit, then this is a no brainer. For the more adventurous amongst you, Aerial Extreme is fantastic fun. You can get the adrenaline pumping on the huge zip wire, rope course, climbing frames, and more. There are a few other around the country as well if you don’t happen to be heading to Yorkshire. See more on the Aerial Extreme website. Opened in 1878, the Leeds Grand Theatre is considered a major milestone in Victorian theatre building, and those who have trodden the boards over the years includes Laurence Olivier, Julie Andrews, and Felicity Kendal. There’s always something on for the whole family, so well worth a trip. Find out what’s on at Leeds Grand Theatre. A Grade II* listed Edwardian performance hall, the Royal Hall Theatre in Harrogate is a truly spectacular place to enjoy some theatre. There are a few lovely theatres in Harrogate, but this is the pick of the bunch and a must for anyone who loves theatre or just a nice night out. See what’s on at the Royal Hall Theatre. Another wonderful theatre, the Grand Opera House in York always has a packed programme throughout the year, including West End musicals, stand up comedy, live bands, and more. See what’s on at the Grand Opera House. The Civic, in its different guises, has been a part of Barnsley’s history since 1877, and puts on a varied artistic programme, including theatre, comedy, dance, family shows, and more, so there is always something on that’s worth checking out. Find out what’s on at The Civic. We can’t mention things to do in the evenings and not mention the amazing opportunity to go stargazing in Yorkshire. 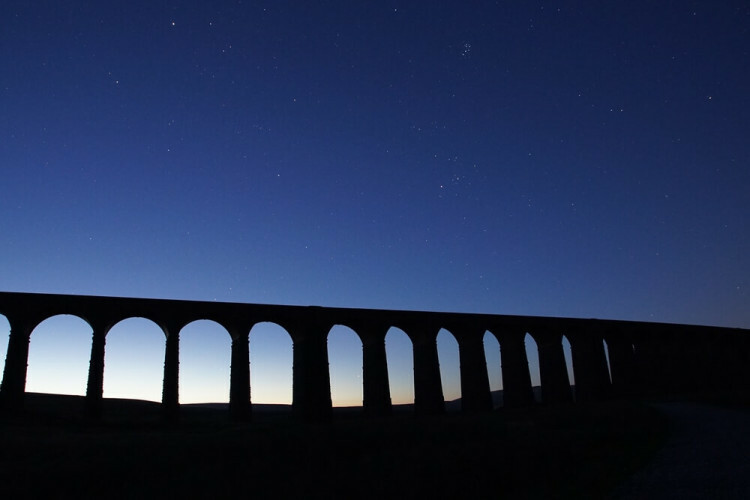 The Yorkshire Dales are one of the best places in the UK to enjoy the stars, with four designated Dark Sky Discovery Sites where you could see as many as 2,000 stars on a clear night. You might even catch a glimpse of the Milky Way, and if the conditions are right the Northern Lights. See more about how to go stargazing in Yorkshire. If you want something super swanky with unbelievable food, amazing atmosphere and a luxurious place to stay the night, then the Pipe and Glass Inn could be perfect. Located in Beverley, East Yorkshire, it has an a Michelin Star since 2010. Find out more about the Pipe and Glass Inn. Based in Sheffield, Silversmiths has a truly mouthwatering menu featuring plenty of local produce from all over Yorkshire. Seafood, steak, pies, afternoon tea – whatever you want, there’s a good chance you’ll find it at Silversmiths. See what’s on their menu. Wensleydale is a wonderful place to visit for many reasons, but the main one is obvious – cheese! 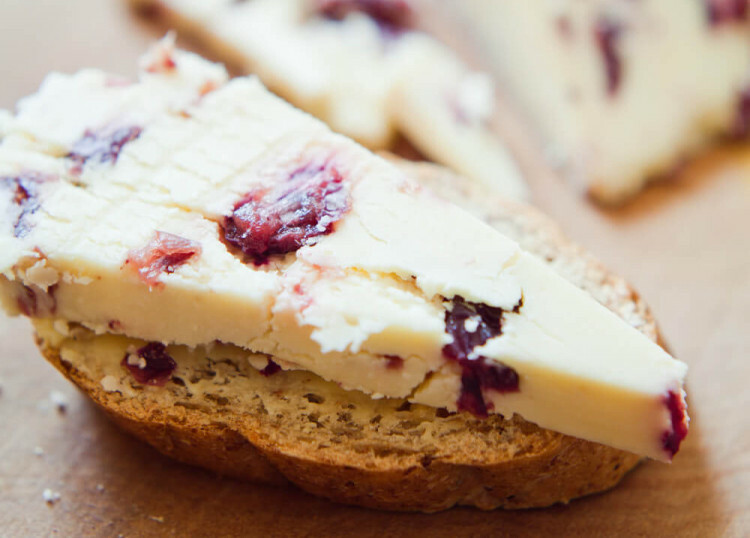 At the Wensleydale Creamery you’ll will learn all about the world-famous cheese, but there’s also plenty of opportunity to fill your face and take some home with you. 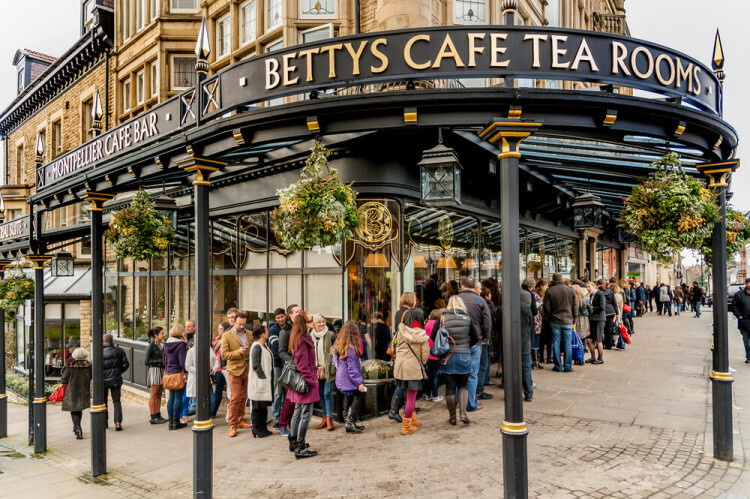 Betty’s have tea rooms all over the country now, but if you want to see where it all started, you need to head to Harrogate. But it’s so much more than somewhere to have afternoon tea – they have an amazing shop in which to buy lots of lovely treats, and even cookery classes! Book a table on their website. This brilliantly named cafe-slash-restaurant-slash-deli specialises in meats and cheeses, so if that’s your thing, you should make a point of visiting them in either Leeds or Ilkley. See more about Friends of Ham. Originally built in 1715, Whitelocks is the oldest pub in Leeds, and is perfect if you want something hearty to eat with a pint of real ale or a craft beer. They also have a large beer garden, free Wi-Fi and it’s dog friendly too! Mannion & Co are an absolutely outstanding eatery with a place in York and one in Helmsley. You can eat in and take away some of their amazing cakes, meats, salads, pastries, and much more. But you can’t book – it’s first come, first served! A delightful village pub in Brearton, the atmosphere is welcoming, the food is fantastic and there’s plenty to drink, so it all sounds pretty perfect to us! 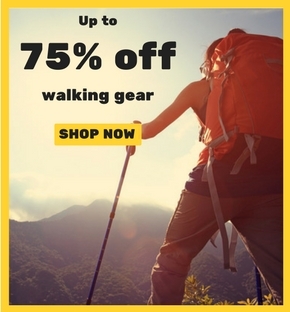 They also have a section on their website about local walking routes, so we’re even more impressed! See more about The Malt Shovel. The North Yorkshire Moors Railway in Pickering & Whitby – The world’s most popular heritage railway & longest historic steam train ride. Sutton Bank National Park Centre – views from there have been described as the “finest in England”. Whitby – the only place in Britain with a ‘double-sun’ effect, where during the summer you can watch the sun rise and set over the ocean. For more information about the Yorkshire Coast and North York Moors, including full event and festival listings or ideas for places to stay during a visit to the area, visit www.discoveryorkshirecoast.com and www.yorkshire.com. So there is our list of amazing things to do in Yorkshire, but we still feel like we’ve barely scratched the surface. Let us know in the comments, on Facebook or Twitter what are you favourite things to do in Yorkshire. And not forgetting the Ampleforth Village market which is held on the last Saturday of every month ,except for the Special Christmas Market on Saturday 23rd December . The market is held at the White Swan in Ampleforth which was voted Yorkshire’s Favourite Pub 2017 and also finalists in the White Rose Awards for the Best Yorkshire Pub and in the Flavours of Herriot Award for Best Pub Food .